Enhancing patients’ health care experiences means more than just providing top-notch clinical care. It requires care that addresses every aspect of the patients’ encounters at the clinic – their physical comfort, their understanding of what’s happening and their emotional needs. The Triple Aim framework reinforces the importance of achieving three goals in health care: improving the patient experience of care; improving the health of populations; and reducing the per capita costs of care. The first of these, improving the patient experience, benefits not only the patients, but the clinics treating them as well. A better patient experience results in improved clinical and business outcomes. As competition for patients increases, patients may make provider choices based not only on clinical outcomes, but also on whether their doctor or mental health clinician delivers compassionate patient-centered care. Another study found that the major determinants of patient satisfaction were physical comfort, emotional support and respect for patient preferences (Jenkinson et al., 2002). These studies reinforce the importance of the softer side of the patient experience. Avoiding stigma. Mental health clients’ satisfaction with care depends not only on the drivers mentioned above, but also feeling welcomed when they seek services. Some clients with mental health issues report that their health care providers appear to be uncomfortable addressing psychological issues, or may not feel they have adequate time to explore them. In the end, however, these patients suffer because they are less likely to get the physical care they need. All health care providers need to be aware of strategies to improve the patient experience for patients with mental health concerns. Clinical benefit. According to the Agency for Healthcare Research and Quality (AHRQ), improvements in patient experience are linked to improvements in clinical outcomes. Multiple studies over the past two decades have concluded the same thing. Patients are more likely to accept medical care and follow treatment plans if they feel they communicate well with their providers (Zilnierek & DiMatteo, 2009). A 55-study research review found positive associations between patient experience and health outcomes, adherence to a treatment plan and medication, and preventive care (Doyle et al., 2013). Other studies focusing on particular patient populations found similar results. For example, patients with HIV reported that if their provider knew them as a person, they were more likely to adhere to treatment than if they did not (Beach, Keruly & Moore, 2006). Another study showed a positive correlation between a physician’s perceived empathy and attentiveness, and cancer patients’ capacity to deal with their disease (Zachariae et al, 2003). Business benefit. Practices with strong physician-patient communications realize a number of business benefits, such as better patient retention. Patients reporting poor-quality relationships with their physicians were three times more likely to leave the practice than those with the highest quality relationships (Safran et al, 2001). 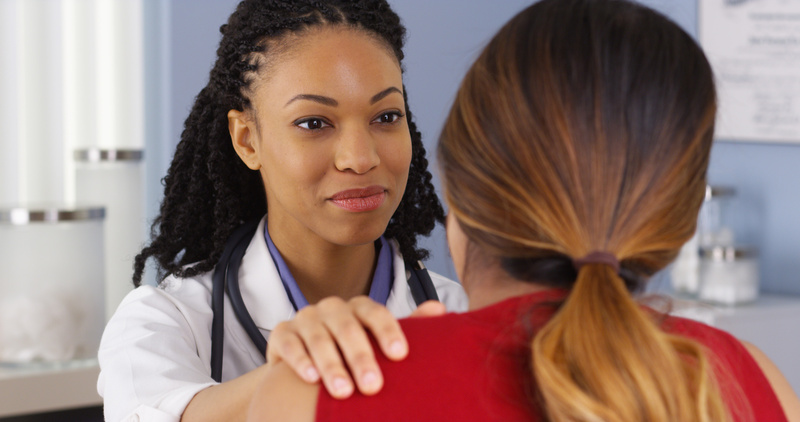 Patient-centered communication is also associated with fewer unnecessary diagnostic tests and specialty referrals, as well as better recovery from discomfort, and better emotional health two months later (Stewart et al, 2000). Last but not least, physicians who were more skilled in patient communication were less likely to be sued. These physicians educated patients about what to expect, laughed and used humor more, solicited patients’ opinions, and checked their understanding (Levinson et al, 1997). Patient-centered care was shown to improve physician satisfaction and retention among primary care providers (Suchman, et al, 1993). Tips for Communicating with a Person with Mental Health Problems (.doc) are intended to help improve communication. Triple Aim Measurement Toolkit: A Resource for Health Centers (website) produced by the American Institutes for Research and the Blue Shield of California Foundation. PHYSICAL HEALTH: People seen as having a mental disorder are less likely than others to get the physical care they need even when they seek it out. Those with schizophrenia are less likely than the general population to receive basic health checks like cholesterol and blood pressure measurements (Roberts, et al., 2007) and substantially less likely to undergo cardiovascular procedures (Druss et al., 2000). Those with co-occurring mental disorders and diabetes are less likely to be admitted to the hospital for diabetic complications than those without mental disorders (Sullivan et al., 2006). HEALTH REFORM: Enhancing the patient care experience is one of the Centers for Medicare Medicaid’s “triple aim” objectives. QUALITY CARE: A welcoming environment is consistent with good patient care. Health plans (such as Blue Cross Blue Shield of Massachusetts and HealthPlus of Michigan) and multi-stakeholder organizations (such as California’s Integrated Healthcare Association) are incorporating patient experience scores into provider pay-for-performance incentives. The Accountable Care Act now links performance related to patient-experience metrics to reimbursement. Patients/clients who have been historically judged and stigmatized and subsequently dismissed and given poorer care are the most vulnerable in systems with substandard customer service. Those with severe mental health conditions, addictive disorders, chronic pain, or those who are homeless suffer more from a lack of empathy and understanding in healthcare organizations. Building organizational climates where skilled empathy conveyance is expected and practiced with these most vulnerable patients/clients ensures that all patients will receive the most respectful care. One of the primary drivers behind the integrated behavioral health movement is the fact that receiving mental health treatment in a primary care clinic is a less stigmatizing and more normalizing experience for the clients than accessing specialty mental health. But according to clients’ reports, stigma still dwells within primary care.